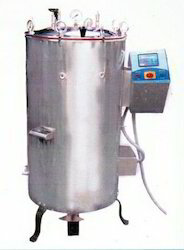 Prominent & Leading Wholesale Trader from Secunderabad, we offer automatic high pressure sterilizer vertical 16 x 24, horizontal sterilizer 20 x 48 and high pressure sterilizer horizontal. We are a most trusted name amongst the topmost companies in this business, instrumental in offering high quality array of Medical Sterilizer (Medical Horizontal High Pressure Sterilizer). Leveraging over the skills of our qualified team of professionals, we are instrumental in offering wide range of High Pressure Sterilizer.